Boil 1 1/2 cups of water with salt, add the soya chunks to the boiling water and cook for 2 to 3 minutes on medium flame. Switch off and drain the water. Leave it for few minutes. In the mean time, carry on with other work. After some time, squeeze out the excess water from the soya chunks and place in a wide bowl. Add the Ginger garlic paste, turmeric powder, red chilly powder, curd, salt and combine well with the soya chunks. Keep it inside the refrigerator for 30 minutes. Now take a pan and heat a tsp of oil and saute the cubed onion first. Saute until it turns translucent and then add the fennel seeds, ginger, garlic and saute for 2 minutes on medium flame. Add the cubed tomatoes to the mixture and stir together until the tomato gets cooked. Now add the mint leaves and saute for 15 secs. Finally add the garam masala powder(if using) stir together with the masala. Switch off and cool down the masala. Grind them to a fine paste. Clean the basmati rice and soak for 10 minutes. Add the ghee, oil together in a pan and heat for half a minute. Add the sliced onions and fry them well until it turns translucent. next drop in the green chilly and saute well. Now dump in the ground masala and mix together with the masala. Cover and cook the masala for 3 minutes on medium low flame. Cook the masala until the oil starts oozing out. Now add the marinated soya chunks and the green peas, gently coat with the masala. Now add the biryani masala powder(if using) and scald well with the masala. Add the coconut milk (3/4 cup) and water(altogether should come around 2 1/2 cups of liquid,including coconut milk) to the masala and stir together. Cook the masala until it comes to a boil. Add the coriander leaves, lime juice and combine well. Add the soaked rice into the boiling water, mix thoroughly. Cook open until few bubbles spotted on top. Cover the pot now and cook on really low flame for 10 minutes. Use a fork to fluff the rice and serve hot with raita. I've added 1 1/2 cups of liquid to 1 cup of rice as we always prefer little softer to bite. 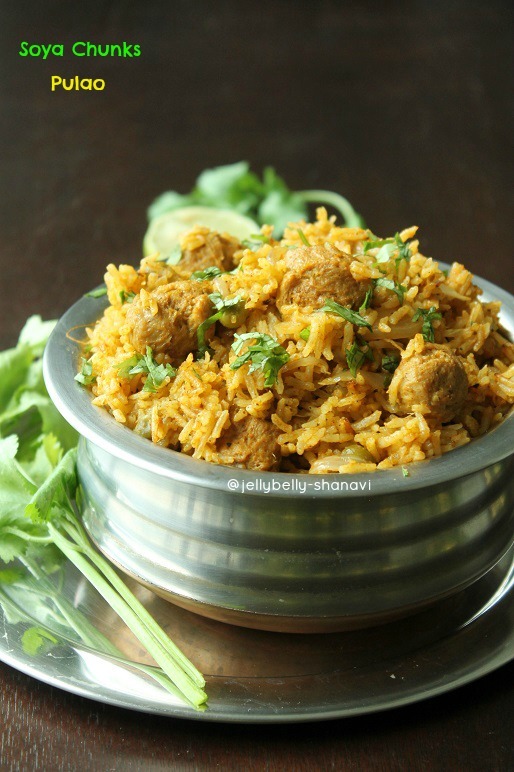 Add MTR pulao masala which gives exceptional flavor to the dish , also u may totally skip garam masala powder n biryani masala powder. We like to see more soya chunks on each serving and that's y I've added 1/2 cup for 1 cup. Add acc to ur preference n availability, just like u add meat for biryani. 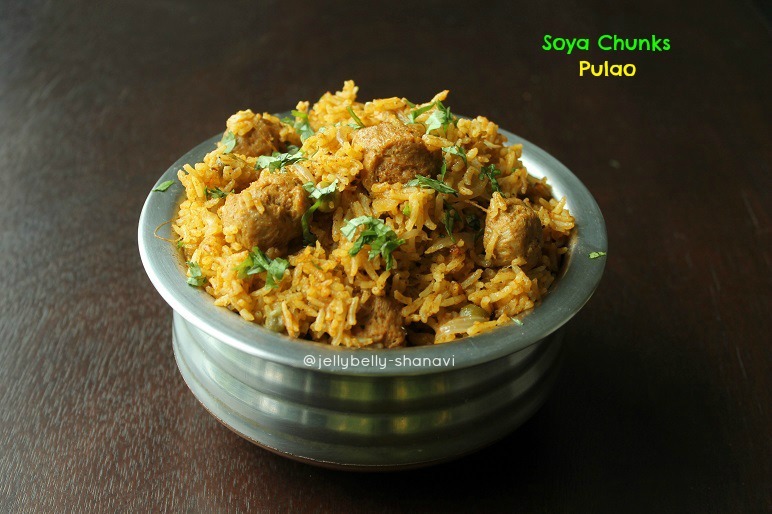 Marinating the soya chunks gives extra-ordinary taste to the pulao. If u don't find time, keep the soya chunks in the freezer for atleast 10 minutes before u start ur prep work. Soyachunks pakkathavanga intha pulao va paatha mutton pulao'nu guess panniduvanga, very tempting and beautifully done. biriyani looks more appealing dear.. nice click.. Perfectly done Sho.. 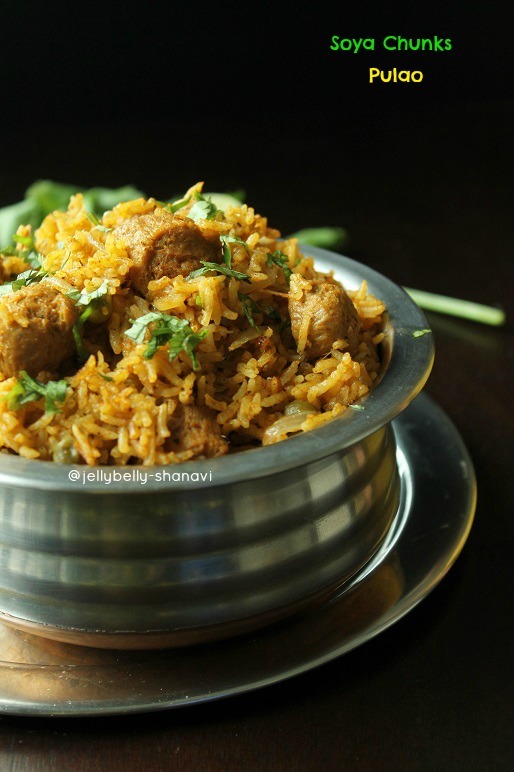 I haven't tried my hands at MTR pulao masala still.. gonna try soon..
Wow.. Looks very inviting :) Yummy clicks too !! Class photos Sho..Kudos to your effort. Paloa looks outstanding as usual..
Nice paratha and loved the marinating part.